Now, I write poems for my kids, and hide their presents. I do it for Christmas, and for birthdays too. And now that my boys are old enough, there is no longer any need for holds barred. The mighty cauldron of my brain bubbles up a happy soup of doggerel laced with surrealism, family in-jokes, obscure movie references and truly bad puns. It's great. I'm taking the next week or so off from blogging. When next I post, we will be into My Big Year, and Questors will be officially official. But will it arrive in the shops in time to be on the shelves for January 4th? Will I get good reviews? Will I get bad reviews? Will I get any reviews? Will my photo spontaneously combust at the Newsagents? Happy Christmas, Merry New Year, and Random Good Wishes, Joan. On Saturday Walter Neilson from The Scotsman came to the house and spent just under two hours taking photographs of me. He was a very nice man with groovy glasses who had obviously never heard about the inadvisability of trying to make a silk purse out of a sow's ear. I offered him my eminently photographable sons, my cat (the good-looking thin one), and the truly fabulous view out my front window, but he was determined to get a picture of me. Which raises that cosmic question - why are some people photogenic, and some of us so utterly not? And why do the unphotogenic ones CARE so much? Am I a worse writer because I can crack a camera lens at forty paces? Will people not buy my book because of it? Let's face it, it's got nothing to do with anything but vanity - that odd thing we harbour no matter what the evidence. I expect there's a gene for it, right beside the gene for fantasy generally. And if that's the case - I spent a good bit of time this Saturday on my own line of work! So good for me. It's not all Word Counts, you know! Cheers, Joan "My-face-I-don't-mind-it-cause-I-am-behind-it" (as my mother has been known to say) Lennon. Whatever you do, don't wear black. Look like you've made an effort. Whatever you do, don't look like you've made an effort. Don't dress like a teacher. Try not to look like somebody's mother. Give them something interesting to look at in case what you're saying isn't. It's tough. I don't know what to call what I do, and I don't know what to wear when I'm doing it. Thank goodness it's the writing that's my day job - for somebody whose commute involves coming downstairs, jammies and a dressing gown are the garments of choice. And I can call it anything I like! P.S. Here's me, clutching Questors, in one version of my gig/talk/visit gear. 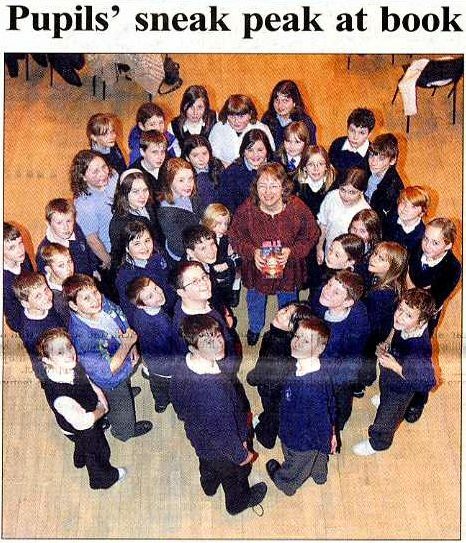 Photo courtesy of the Angus Courier, 29 Nov. 2006, Kirriemuir Town Hall. It All Started in Kirriemuir! I did my first talk on Questors this week in the Kirriemuir town hall, and two more interviews - one over the phone, standing in the middle of the Kirriemuir Library in my raincoat. That was with the reporter for the Angus Courier, who instead of coming to hear me was covering a Council meeting. Personally I think he drew the short straw on that one, but I may be prejudiced. The other interview was with someone from the Young Scot website. I haven't seen either of these yet but will let you know. The talk went well, the kids were great, and the blood on the poster hardly showed at all. I do like P7's - they're good company. I picked up a handy tip from another writer for the book-signing bit - have a pad of paper for them to write their names down on for you, so you don't make a hash of it in their book by guessing wrong, or take forever getting them to spell it out loud (or, often, inaudibly soft). It worked! Ice Road is finished and with my agent for vetting, and I have no more talks or interviews lined up for the immediate future. So there's now nothing between me and getting stuck back in to The Walking Mountain except a bunch of Christmas baking. "The Walking Mountain - what's that?" I hear you cry. Tune in next week to find out.